After his fortieth birthday, Paul La Mar went for his annual medical checkup. He expected bad news; having successfully lowered his cholesterol before through diet and exercise, he'd gradually stopped running and lived mainly on deli food. At 5'10", his weight had crept up to 190 pounds. More worrying, his cholesterol had skyrocketed to 362 and his triglycerides to 1,376. His doctor's prognosis: Paul needed medication to lower his blood lipid levels. "I'm already on medication for hypertension, and I don't want to be on more medication or a heart disease statistic," Paul says. Paul bargained with his doctor: If he could lower his cholesterol and triglycerides dramatically, he wouldn't have to go on medication. The plan: to rehabilitate his diet and step up his fitness level. "I've started running again. I'm currently logging about ten miles a week and plan to get up to twenty-three miles a week." Then New York City nutritionist Sara Cowlan, M.S., R.D., stepped in to analyze Paul's diet and find the cholesterol-elevating culprits. Here are a few entries from Paul's food diary. "This man should not be drinking," says Cowlan. "His high triglycerides [normal range is under 200] puts him at risk for pancreatitis and diabetes, and it's not good for his heart, either. 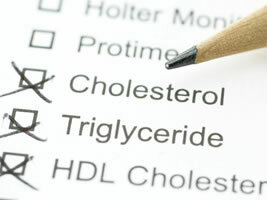 High triglycerides are considered an additional risk factor in heart disease, like smoking, family history, overweight, sedentary lifestyle, and elevated cholesterol. When someone's triglycerides are three or four hundred, I'll suggest dietary intervention to prevent further increase. But when they're this high, you shouldn't be drinking." Alcohol is also contributing too many calories to Paul's diet. Although he shouldn't drink at all until his triglyceride count plummets, if he does drink, red wine in preferable to beer: The polyphenols in red wine may help protect against heart disease. As for his choice of foods, Cowlan notes that Paul's diet is high in fat, particularly saturated fat—a big factor in his high cholesterol level. "It's also very high in simple sugars, especially from the huge quantities of fruit juice he consumes. Sugar as well as saturated fat will elevate triglycerides," says Cowlan. She suggests dumping the fruit juice drinks for water and whole fruit. "Adding more fiber in the form of fresh fruits, vegetables, and whole grains will help protect against heart disease. In particular, he should try to incorporate more soluble fiber—found in oatmeal, oat bran, rye, sweet potatoes, carrots, and beans—because it will help lower his cholesterol." The cholesterol-lowering salad dressing is a step in the right direction. Cowlan points out that these products need to be used two or three times a day to be effective. "He should also make sure that the light butter he's been using is trans fatty acid-free," says Cowlan. "Otherwise, if it contains hydrogenated oils, it will increase his cholesterol." Two spreads to seek out: Promise Butter Light and Smart Balance Light. Whole wheat bagel with Benecol or Take Control (cholesterol-lowering spreads) or 2 tablespoons peanut butter; one serving of vitamin C-rich fruit like strawberries or cantaloupe; water. "Ideally, he should have oatmeal or a fiber cereal, but it's important to be realistic. If I drastically change Paul's diet, he won't stick to it. I want him totally off the bran muffins, so I'm willing to give him a bagel instead," says Cowlan. Bran muffins can contain as many as 800 calories and 40 to 50 grams of hydrogenated fat. The peanut butter may offer some protective effect against heart disease. Turkey or chicken breast sandwich on whole wheat or rye, with lettuce, tomato, and mustard; salad with mixed vegetables and cholesterol-lowering dressing; Diet Snapple, ice tea, or water. Cowlan tossed out the tuna sandwiches—they're loaded with fat. "Paul can have his favorite lunch—pizza—three times a week maximum. On pizza day, Paul should order two slices, one plain and one with vegetables. And he should blot them with a napkin to eliminate excess oil," she advises. "Paul needs the fiber from the fruit," says Cowlan. "If he needs more food, he can have an ounce of nuts." Walnuts are a particularly good choice because they contain Omega-3 fatty acids. Sushi; a vegetable; salad with cholesterol-lowering dressing; Tasti D-Lite. Of all the foods in Paul's diary, Cowlan suggests he keep sushi. "He should try to eat tuna, salmon, or mackerel two times a week for the Omega-3 fatty acids," Cowlan advises. "Other good dinner choices would be half a rotisserie chicken without the skin or a grilled chicken breast sandwich on whole wheat or rye bread, along with salad and a vegetable." While Paul found most of the diet easy to swallow ("I can definitely lay off the fruit juice and the cheese"), he's not planning on giving up alcohol yet. "I'll probably cut the amount I drink in half and stick mainly to red wine. It wouldn't be realistic for me to say that I'll cut it out totally," he says. Paul's going back to the doctor in a month and hopes that making dietary changes and upping his running mileage will bring his cholesterol down in the low 200s and cut his triglycerides in half. "If I go back to the doctor having had a few beers and some wine, and my triglycerides are still high, then I know I'll have to give up the alcohol." Paul is determined to get his numbers into a healthy range, his way. Do reduce your intake of sugar and other "white carbohydrates" like white bread, bagels, and pasta. Do reduce the amount of fat you eat, especially saturated fat. Do use a trans fatty acid-free spread like Promise Butter Light or Smart Balance instead of regular butter or margarine. Do increase your intake of Omega-3 fatty acids by eating 7 to 10 ounces of fish—especially tuna, salmon and mackerel—two or three times a week. Omega-3 fatty acids are also found in walnuts, flax seeds, soybeans, canola oil, and soybean oil. Do eat plenty of fiber, particularly soluble fiber, by adding whole grains, fruits, and vegetables to your meals. Do drink water instead of juice, sugary drinks, or diet sodas. Soda contains phosphorous, which in large amounts can contribute to calcium loss from bones. Don't drink alcohol if your triglycerides are elevated. Do choose red wine over other alcoholic drinks if your triglycerides are within a normal range (below 200). Thumbs up for this incredible discussion of yours. I've truly appreciated perusing this discussion today and I figure this may be extraordinary compared to other discussions that I've perused yet. If it's not too much trouble prop this work up on 1 euro domain the equivalent quality.